Yes, it’s Monday, but since I published a “Sunday Poem” for Mothers’ Day yesterday, I am publishing my “moonthly” I Ching reading for the Taurus New Moon (and solar eclipse) that occurred last Thursday evening (8:29 pm EDT). As I enjoy doing on, or shortly after the New Moon, I cast a Gua, a hexagram, for the I Ching to see what the yarrow stalks had to tell me about the energies for the up-coming moonth. For me this helps put me in a frame of anticipation as I calmly manipulate the yarrow stalks to generate the 6 Yao, or lines, of the Gua. And, after the power of this New Moon, which included a solar eclipse, I really needed both calming and anticipation! 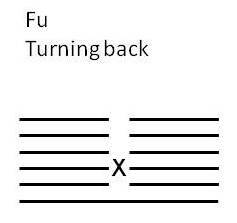 The hexagram I cast was Fu which means “Turning Back” in The Complete I Ching translated by Taoist Master Alfred Huang. As I look at this in the greater context of the New Moon/Solar Eclipse I can see positive change coming as the result; the expected transformation is in its early stages of unfolding. The “turning back” is part of a cycle that may be repeating but the cycle is more like a spiral that rises with each dawn. There is a direction to the cycle: favorable to have somewhere to go! There is a concern expressed here in the third yao, the changing line: the Yao Text for the third six (greater yin) is “Repeatedly turning back. Adversity. No fault. This “turning back” feels like spinning wheels. No progress can be made this way. And while this sense of being stuck may be excusable (no fault) I am glad to receive this warning that there could be some “wheel-spinning” energy the early part of this moonth. 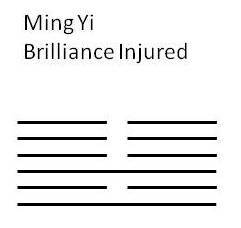 There is a Chinese saying that helps with my understanding of “Brilliance Injured”: “tao guang yang hui” which means “hide one’s light and abide one’s time.” Here too is a message about the energy of the moonth: it might be wise to keep one’s head down and exercise patience. Yes, change is coming; the lower trigram is Li or Fire. But fire is under the upper trigram, Kun or Earth. This is like sunset; the light is hidden under the darkness, below the earth’s horizon. There may be some darkness, some shadow energy hidden in the change energy this moonth. The advice I have taken from this divination is “don’t let the darkness extinguish the light; just turn your light down a notch and remain steadfast and upright. Remember the “turning back” – the sun will rise again. There is one more piece of good news in this accomplished gua, Ming Yi: its mutual gua is Jie, Relief. Biding one’s time does lead to relief! Have a good moonth and keep your head down!